Welcome to our first ever Friday Website Review! In this series, we'll have a look at a reader submitted website each week and provide suggestions on how the site can be improved for better performance and more conversions. ​Theme guides - all the recommended image dimensions for our themes. 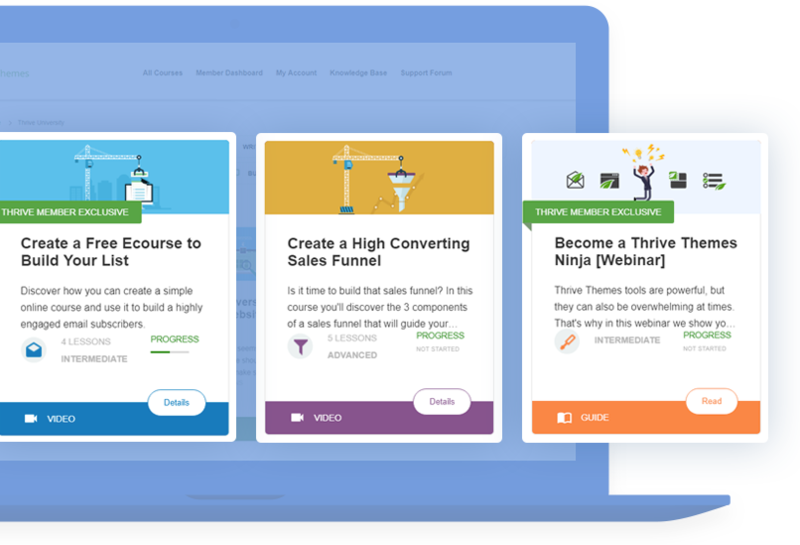 How to create a "Hybrid" sales page. Use this Content Builder feature to create post galleries (like I recommend for the about page). Create content templates - for recipes or any other layout you want to re-use several times. Would You Like to See More Website Reviews? If you have suggestions about how we can make the website reviews more useful, please let us know by leaving a comment below! Thanks for this website review! It actually gave me some things to work on for my own site. So yes, please continue. Hi, Shane! I found this video very helpful. Just so you know, the Thrive Themes image guidelines don’t give sizes for sidebar images. Also, the guidelines give widths, but not height. Do the themes control the height of any of the images, or do we have to choose the height that we want for every image that we upload (other than thumbnails)? Also, the last I read on your forums, several people were saying that they were having major problems with the integrated image compression service that Thrive Themes uses, and they had to stop using it. Do you know what the current status of that issue is? The image width is what matters for the image scaling issue. For featured images in our themes, we generally don’t crop the height, so it’s up to decide how tall you want each image to be. The point about scaling is that if an image is too wide to fit, say, the content area, it needs to be scaled down in the browser, to make it fit. However, if the image is very tall it doesn’t need to be scaled, it will just take up more vertical space (which is covered via scrolling). We’re working on resolving the automatic image optimization issue. I can’t give you a more detailed update than that, I’m afraid. Thanks Shane Melaugh for sharing the review. From my own experience Thrive Themes is working well if the image dimension is adjusted properly with Photoshop before using on web! Yes, it’s very beneficial to scale images to the correct size for your site. I found this first review interesting and helpful. Keep ’em coming! I always learn something from your videos. You’e a great teacher! Great post…. got a few nuggets from it. Glad to hear that, Paul! Thank you Shane! I am a new member and would appreciate seeing more website reviews. Best practices are a great support. I have to say I am in awe of how much Thrive offers! Thank you for your comment, Kristen! Great review, thanks for giving the resources following. really Helps. Thank you for the comment and suggestion, Mark! thank you for this review! It was really useful for me (or will be ;-) ) – Keith is right, you are a good teacher. For example, you got really clear for me why I should not have different offers on the home page. So, please continue this series! Thanks Shane! Appreciate this new content! Thank you for commenting, Gio! Great video – useful to me even though my websites are in different niches. Are you going to bring out a theme guide for the Pressive theme? I would like to know the recommended image sizes. You’re right, the theme guide for Pressive is missing. We’ll add that as soon as possible. Great new series Shane, very informative! Shane, this is a really useful video. It is always extremely helpful to see web site examples with excellent editing suggestions. Keep them coming please! Glad you found this useful, Peter! Thanks Shane, really informative and will drive me to action. What an excellent Review Shane! This is so practical and valuable to any budding website owner. Please continue with this as it has much greater value than a standard ‘theoretical’ tutorial. I now have three notes on what (more) to change on my site…. So, this is another positive vote for the usefulness of these Friday videos. Thank you, Trevor! Very good to know that people are actually taking action on the contents of this video. Very useful! If you do take on more sites to review, I’d love the critique. Thank you, Sam! If we keep doing these reviews and we open for new submissions again, we’ll post an announcement in one of the future review videos. This is excellent! Very helpful guidelines and so valuable to be reminded of what we should be thinking about at each stage of design. Please keep them coming! Thank you, Malcolm! Glad to know that you found this video valuable. Outstanding review…that’s easy to say for me. Seriously, your critique was very informative and I appreciate the ideas you shared. If you do decide to review mine, please let me know in advance so I can schedule an appointment with my therapist !! There is a nice free WP plug-in wp-smushit (https://wordpress.org/plugins/wp-smushit/) that can automatically optimise images on WP website for web. Yes, good one. This is the one I used before Thrive Themes and the automatic optimization built into them. Thanks for the website review – really insightful and valuable – much appreciated! Thank you, Dan. Glad you liked it! This is great and I look forward to more! This review was very helpful for me in doing more tweaking on my site. I appreciate your way of teaching and the practical application you offer in your videos. And I just have to give a plug for your tech support team. I have never seen anything like them! They are friendly, helpful and their response times, to my queries at least, has really gotten short! Keep it up! Thank you very much, Paul! Yes, we have some really great people in our support team and I’ll forward this to them. Glad you enjoyed it, Lelio! Hi Shane, the review was very helpful, particularly as I am about to design a recipe site for a client. Commenting on a live website is a great teaching tool. I hope you are encouraged to make this a permanent feature. Hi Shane, very constructive and to the point! Thank you, John! I was a bit worried about the length of this video, but it seems that wasn’t an issue for most viewers. Shane, this is phenomenal material. You ALWAYS provide superb teaching. Thanks for the high value content and actionable material. I am currently working on my new site, http://tlcforyourbiz.com but I would love your review of it when it is complete. Thanks for the great work and great products – and keep it up! I really enjoyed the website review session. This was very helpful. I watch to watch more and would love to have to review my Thrive theme website. That’s great to know, thank you very much, Judy! you mention that there could be more relevant information above the fold if the image had text over it. Is there a way to achieve this with Thrive themes (I use Minus)? Above all with clickable area/s / opt-in-form? And/or with TCB that I use too? I know how to put text on a photo with Photoshop and then upload it but that’s not what I mean. I mean a tool or plugin with wich you can put any text on the header photo (and have it scalable as the header itself, of course). You can use the header options for this, but that’s not what I’d primarily recommend. Space above the fold is precious, so I would stay away from any design that takes up a lot of that space on every single page on your site (an exception to this would be a Focus Area, which basically uses this above the fold space to drive visitors towards your most important conversion goal). Instead, I recommend using an image with text overlayed only on landing pages where it makes the most sense (e.g. your homepage). You can do this by creating a page section with an image background and then adding whatever content you want on top of that image. Love Love Love this Shane…practical applications are always better than abstract statements about “what to do.” I took some of the hints from other videos you’ve done and took a crack at my home page and navigation. Not great and getting better with vids like this. Now off to share it! Thank you! Very happy to see that you’re putting things into action right away! Thank you very much, Gary. Happy New Year to you and yours too! Thanks for a very practical review of this website. Please do more of these. I thought that this was very useful,it is always good to pick up tips by actually seeing a live demonstration. I hope that you do more of these. Thank you. Thank you for your comment, Anita! Thank you Shane for a very informative training. I have a Squared theme set up but haven’t started any pages or posts yet because I was at loss as to how to do it. This has been so helpful. Please continue. Glad to know this video helped you take the first steps, Joan. Excellent video Shane as always! Please keep up with these videos, it will be another great reason to look forward to Fridays! Happy New Year! Thank you sir for this review. I actually changed several things on my blog as I was watching your review. I just paused and went over and corrected via your suggestion. Excellent content! Nice! Congratulations on taking immediate action like that! Let me first tell you how excited I am coming across Thrive Themes. I follow a handful of internet markets and you are by far the best teacher. Your teaching style is phenomenal. I do have a couple issues that I hope you can help me with. 1. What is the best way to upload images onto your wordpress site? I followed your post on how to set up your FTP client but whenever I upload images they don’t show up in the media library. Can I upload them directly from my computer? 2. What exactly do you use the FTP client for? I am confused as to why I cant upload files directly. 3. If I upload a PDF file through my FTP client and want to get it on my wordpress site, where would this show up on my actual website? Sorry for all the questions, these few issues are driving me crazy and I am a complete newbie. For images, there’s no reason to use FTP. You can easily upload them directly through WordPress. And the same is true for PDF files as well. For WordPress, I rarely use FTP at all. One instance that can happen is that there’s an upload limit set by the host, which means you can’t upload large theme or plugin files. In that case, uploading via FTP is a solution. i think this is a great idea. I often see blogs showing something like – ” Top 40 Best Responsive Websites ” – but never with an in depth review of a single site like this one. Getting the big picture is very helpful. Thank you for your comment, Richard! More website reviews are coming soon! Thanks Shane. This type of advice really streamlines the creative process. Very valuable tips. The ctrl+f5 fresh reload is very useful. Glad you liked it, Rudy! Ctrl+F5 is a good thing to know about, yes. Whenever something looks strange on your site, doing a hard refresh like that will also show you whether it’s a caching issue or not. If it’s a caching issue, a hard refresh will fix the problem. If not, the issue will remain. This was awesome! Keep it up! I want to thank you so much for your informative video. It is really like having a video collection here for me. Been tinkering with wordpress for years. Haven’t really had any idea what I was doing until Shanes blog came about. Very helpful reviews. Most valuable wordpress course anywhere. With the software back end to deliver. Many thanks. Thank you very much for this comment, Rob! I’m very happy to hear that this content is helping you with your work. Thanks for this valuable information. I’ve just installed FocusBlog Theme and had it on my To Do list to revisit image sizes – so this is timely to say the least. Does the ThriveTheme Image Optimization only work on images uploaded after the theme is installed?, i.e. will I need to reload old images used on the previous theme in order for them to be optimized via the built-in tool? Thanks again, and please keep the Friday series running! Yes, that’s correct: we can only automatically optimize images that are uploaded after the theme is installed and activated. Excellent , Very good review Shane. In addition shows why one can be powerful with a good tool to make changes quickly, Keep up the great work Shane, your business will grow from strength to strength because of your desire to help your customer base. We appreciate your efforts, thank you. Thank you very much, Collin! This is a brilliant idea by reaching out like this to show us the steps in bettering our websites is godsend. Keep the Friday website reviews. Will this theme be useful for a photography website? I think it can be helpful to customize any design. Thanks for the great tips. In principle, it can be. We have not created any features that are specifically catered to photography websites, though.